Stop for a moment and think about what kind of adulthood you want for your child. The premise of Time-Out for Parents by Cheri Huber and Melinda Guyol is that you must become what you want for your child. Modeling a happy, fulfilled adulthood is the best method of raising happy, fulfilled adults. And to do that, you must take time for yourself, and allow yourself to feel and express all your emotions. Cheri Huber has been a zen teacher for more than thirty years. Since the use of “time-outs” for children have been in the parental repetoire for about the same length of time, she now has students who equate sit meditation with punishment. Whoops. Probably not what well-meaning parents intended. 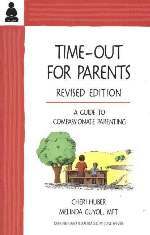 Time outs are most frequently used when the parent is at a breaking point, so it follows that it’s parents who need a time-out. 1. Be present to your inner self. 2. Accept that you have needs. 3. Attune to what is needed. 4. To the best of your ability, meet the need. Here’s an analogy from the book that made perfect sense to me: Waiting to express an emotion until you’re on the brink of losing it is like gobbling junk food because you’ve waited too long to eat. It doesn’t make you a bad person, but you’re better off geting in touch with your body and acting sooner next time. Throughout the book, the authors ask you to stop at various points and look inward. Pay attention to your breath and your body. Identify any emotions that surface as you read. This book is grounded in zen philosphy. You don’t need to be a buddhist to appreciate the concepts in this book, but the language about looking “inward” and finding our “true selves” can be a turn-off to some. If you hear an inner critical voice when you come to those concepts, I recommend you tell the inner voice to get lost. Keep reading, keep breathing. In the last few months, my husband and I have completely reformed our relationship with money. We were not in debt, but experienced a series of unforeseen expenses that drained our emergency fund (meager as it was) to almost nothing. The turning point was an unexpectedly large car repair bill; we realized we were one more emergency away from going into debt. We both work full-time and make a good income, but we had no savings to show for it. I realized that my spending behaviors were the biggest impediment to our success. Eating out at work, visits to Starbucks, buying way more clothing for my daughter than she could possibly wear. A book here, an iTunes purchase there. I had been turning towards the right path for about a year or so, starting my own savings account, reading Suze Orman books. But as soon as my money market balance would reach a couple hundred dollars, I would plan a weekend trip or go shopping. After the big car repair, we started looking around the internet for money savings ideas. By far, the best resource we found was the personal finance blog the Simple Dollar. Not only does Trent Hamm offer practical tips on frugality, he is constantly examining the psychological relationship people have with money and offering insights that will forever change your feelings about what money is for. I read it everyday to remind me what we’re doing and why. We set a goal to eliminate all discretionary spending until had an emergency fund that could cover five months worth of expenses. We trimmed hundreds off our monthly budget by carpooling, cancelling our landline, cancelling Netflix, cancelling our dog’s weekly trip to daycare, getting a better price on car insurance, and cancelling our once per month housecleaner. We each used to get a sum of money on payday to spend as we pleased. No more, we leave our debit cards at home and pack lunches everyday. We paid cash for a cheaper car, sold our more valuable car, and put the money in the bank. We found ways to save energy around our house. We submitted paperwork for our medical and dependent care reimbursement accounts and pulled all our money together in a savings account where it earns a decent interest rate. In less than two months, using every method at our disposal, we have an emergency fund to cover four months worth of expenses. Once we reach our goal, we have a prioritized list of spending. Future savings will be earmarked to a specific purpose; some car maintenance, a new computer, new rain gutters for one corner of the house. My husband and I don’t fight or worry about money anymore. We are proud of what we have accomplished by examining our values and making our spending choices accordingly. We are prepared for the next emergency. Best of all, we’re setting a good example for our daughter.